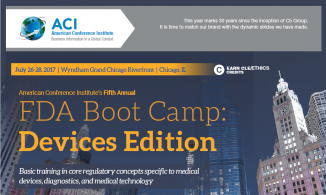 NEW YORK - June 22, 2017 - PRLog -- American Conference Institute is proud to announce that we are bringing our 5th Annual FDA Boot Camp- Devices Edition, back to Chicago on July 26-28, 2017. We specifically tailor this conference to provide regulatory professionals with in-depth coverage of current FDA law and regulations. New for this year, we have a fresh Ripped from the Headlines session, covering key developments in the FDA regulatory bar including cybersecurity, device labeling, off-label promotion, and related First Amendment challenges. This year we are also honored to have Jonette Foy, Ph.D., Associate Director for Policy (Acting), CDER, FDA presenting a keynote address. Esteemed Co-Chair and speaker Patricia Kaeding, Chief Regulatory Counsel at GE Healthcare says: "The boot camp is a terrific way for those new or relatively new to medical device regulation to build knowledge and skills. And it's also valuable for those more experienced as it is an opportunity to hear perspectives and strategies from an array of distinguished experts in FDA law and regulation on a wide-range of top of mind areas and emerging issues."